The ultimate urban forage experience for me in San Francisco is to go blackberry picking. 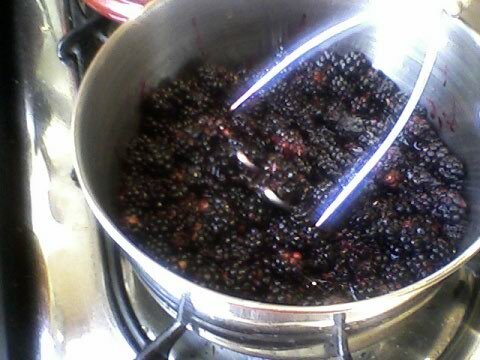 And, this is my fourth year in a row to harvest those tangy, wild blackberries in the city. Blackberry season in this area runs from about early July to early October. I normally go to Glen Park or the Presidio to pick — those are my favorite haunts. This year, I went to Bernal Hill, but it’s slim pickin’ compared to Glen Park and the Presidio. There are other places to go picking just outside the city, as well. There are actually two varietals of blackberry in the Bay Area. There is the Himalayan varietal and the California varietal. The Himalayan’s stem is square-shape and the berries tend to be bigger; the California varietal has a round stem with smaller berries. Both species spread quite rapidly, however I think that the Himalayan varietal causes more heart-ache for the native species. And, blackberry bushes love to hang out with poison oak. Make sure you know the difference between the two and check carefully before you begin picking (poison oak has smooth-edged leaves and stems with no thorns, not jagged like the blackberry). I always make blackberry jam from a simple recipe and use it to top bread, oatmeal and ice cream; and sometimes I just eat it by the spoonful (actually the best is Russian style — make some black tea and then put a little of the jam in a small bowl and then sip tea and eat a spoonful of jam — so delicious). Wash the berries; crush berries in cooking pan and add the lemon; simmer the berries in a pan for at least 30 minutes (low heat, just enough to see bubbles); turn off heat and let cool; add honey to desired sweetness; place cinnamon stick in canning jar; pour berry jam into canning jar to let cinnamon infuse into jam; screw on cap and pressure of cooling jam will vacuum the jar. Picking berries is like a meditation. For me it is the perfect meditation because I don’t really like to just sit. The entire process is a meditation — walking to pick the berries, picking the berries, walking home, and then preparing the jam. Something actually awakens in me that is quite still, sweet and very observant. I always make sure I have a lot of time when I go picking so that I’m not in a rush and I can enjoy all the sounds and sensations; even getting pricked now and then brings my attention back to the present moment. 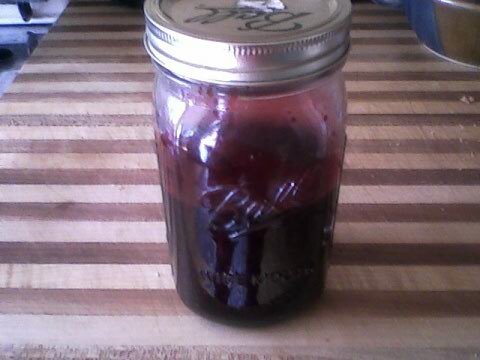 My fingers get stained with deep purple-red juice…bees are buzzing around…a small flock of birds will suddenly lift off from the bushes and fly away…the sun warms my arms… And, eventually I’ll have some delicious, local, homemade jam. 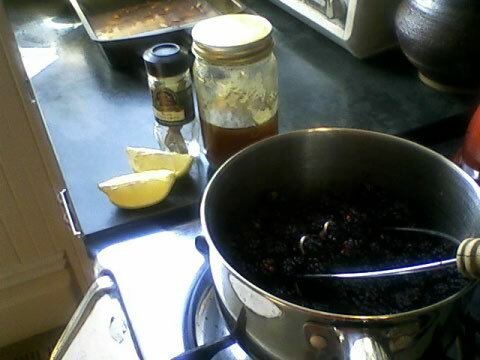 >thanks lisaruth — blackberries are just amazing on about anything i have discovered. love the pancake idea… i also love it on pearled barley…loads of butter and sometimes some cream.